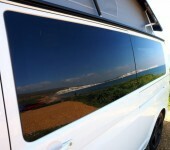 Travel across the stunning Isle of Wight in a Camperbug camper! We’ve got a great selection of lenders on the island. The island holds a warm climate and is one of the sunniest locations in Britain! The Needles are perhaps the most photographed location on the isle and was recently titled ‘Dinosaur Island’ owing to the rich deposit of fossils. Be sure to try local delicacies like rabbit casserole and a delicious serving of fish and chips. To select the perfect Isle of Wight campervan hire, simply scroll through the vans below until you find the perfect home on wheels. Then log in to your Camperbug account and discuss dates of reservation, van amenities and more with van lenders! I am Ermintrude79, hire me today! Ermintrude is our wonderful 1979 automatic campervan with a Cantebury-Pitt roof conversion. With her automatic gearbox Ermintrude is a joy to drive. We will talk you through the simplicity of driving an automatic campervan during your orientation so there is no need for any prior experience. We gave Ermintrude a full interior refit in 2015 so she is looking stunning. She has a canvas bunk for one child up in her pop-top roof and this is suitable for children up to 11 years of age. With a child bunk fitted in her forward cab she can accommodate 2 adults and 2 children. If you have older children or there are 4 adults then not to worry, as with all of our campers, we will supply you with one of our Outwell 3 man stand alone tents at no extra charge. Born in Australia in 1973, he was imported to the UK 8 years ago. In 2015 we found him in Devon and after a five month refit we gave him a new lease of life on the Isle of Wight. 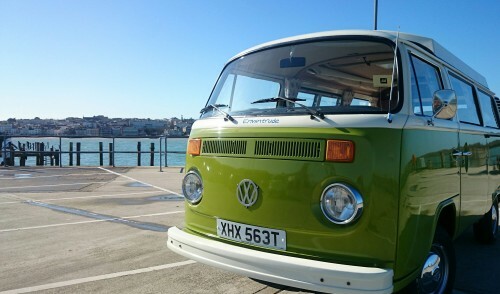 Florence is our beautiful 1978 classic turquoise coloured VW campervan. Florence has a late Devon pop-top roof conversion with two classic seventies canvas bunks that are great for children up to 10 years of age.